From pet-friendly Jackson Hole lodging and hiking areas to supply places, the area can easily accommodate your vacationing four-legged, furry family member. Jackson Hole is a very pet-friendly haven here in the Tetons—you can even bring your pup into the Post Office, where the clerk will toss it a treat! Four-legged furry friends are welcome at a surprising number of motels and hotels, from the in-town Motel 6 to the five-star Four Seasons Resort out in Teton Village. There are also a variety of dog-friendly areas throughout the valley, and some eateries even allow pets to hang out with you (on leash) on their outdoor patios or decks. In addition, the nearby national parks will allow your pet to visit them, too, with some restrictions. Here are some helpful tips for those traveling to Jackson Hole with Fido or Fifi in tow. Because Jackson Hole is a such a major tourist and ski destination, the hospitality industry here wants to make it as easy as possible for visitors to bring their pets along on vacation to this incredibly beautiful corner of Wyoming. Why should pet owners have all the fun? Let your pooch frolic as well! There are numerous hotels and lodges that welcome pets, usually for a small fee. The following is a partial list of places to which Traveler is, well, partial! • Alpenhof Lodge: Two pets up to 50 pounds for an additional fee of $30 per pet, per night. Pet-friendly rooms are limited. • Inn on the Creek: A maximum of two pets are welcome; $25 fee per day is added to your room rate. • Four Seasons Resort: One dog up to 25 pounds are welcome for no additional fee. Please note: Pets cannot be left alone in your hotel room, but if you’d rather not bring them with you for the day, they can enjoy some stimulation from other four-legged friends and humans either during the day or overnight for a special dog-cation. We recommend Happy Tails Pet Resort at Spring Creek Animal Hospital, and DogJax. You can also find pet-friendly places to stay in Grand Teton National Park, such as Jackson Lake Lodge & Cottages, Colter Bay Village Cabins & Tent Cabins and park-run campgrounds and RV parks. When it comes to travel in Grand Teton and Yellowstone national parks, a good rule of thumb is that a pet may go anywhere a car may go (roads, campgrounds, picnic areas) as long as they are on a leash. Dogs aren't permitted on any of the unpaved trails within either park, limiting the day hikes and excursions visitors can embark on while visiting the area. Several restaurants/cafes around Jackson have patios that are dog-friendly in the summer months, such as Cafe Genevieve, Cowboy Coffee, Cutty’s Bar and Grill, Silver Dollar Bar and Grill, Bubbas-Bar-B-Que, and Sidewinders Tavern. Pet Place Plus and Teton Tails are the main pet stores in the area but you will also find pet food and toys at Albertsons, Smiths, KMart and Big R Ranch. If your pet should fall ill or become injured during your stay, we recommend taking it to Spring Creek Animal Hospital. Where Can Rover Run ? Dogs are expected to be on a leash on all pathways and are not allowed in any town parks. However, there are a variety of dog-friendly areas throughout the Jackson Hole area which can be easily identified by the PAWS Mutt-Mitt bags dispensers at the beginning of the trails. Favorite places to exercise your dog include Emily’s Pond on the Snake River and the South Side of the Westbank River Dike. These spots are on either side of the Snake River —with awesome views of the Tetons—and can be accessed on HWY 22 as you head towards Teton Village and Wilson. Cache Creek is an extensive trail network not far from the base area of Snow King and is one of the most popular places for locals and visitors to bring their dogs for a stroll. You can also head into the Gros Ventre National Forest to take you and your dog for a swim at Slide Lake. 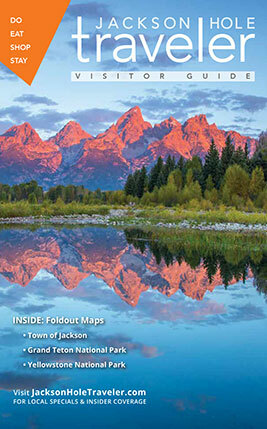 See the pet map for Jackson Hole. There are places throughout the valley, including Bridger Teton National Forest, that have established camping spots and would allow some freedom for your dog to roam. However, for the safety of your dog and passing wildlife, it is important that you keep your dog within your site and command at all times.